Oxi-Go Pro Sport Finger Pulse Oximeter DescriptionOxi-Go Pro Sport Finger Pulse Oximeter is for sale and available from our online store. VitalityMedical.com is the place to purchase Oximeter Plus Pulse Oximeter. Oxi-Go Pro Sport Finger Pulse Oximeter Oximeter Plus Oxi-Go Pro Sport Oximeter is designed sport and aviation use. This pulse oximeter displays SPO2, pulse rate, pulse bar and Plethysmogram. 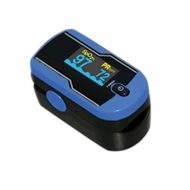 The Oxi-Go Pro Sport Oximeter comes with a high resolution color OLED display. This sport pulse oximeter has 6 display modes for easy reading at all angles. The Oxi-Go Pro Sport Oximeter has very low power consumption with automatic power off and has approximately 30 hours of normal operation. Equipped with a low battery indicator, the sport oximetry device uses two AAA alkaline or rechargeable batteries. The Oxi-Go Pro Oximeter is small and lightweight and comes with a 2-year limited warranty. Dimensions: 2.3 in(W) x 1.3 in(H) x 1.3 in(D) Weight: 0.06 lbs(without batteries) The Oxi-Go Pro Finger-Unit Spot Check Oximeter is not a medical device and can only be used for non-medical activities such as sports and aviation use. It is sold without a prescription only to consumers who do not require a medical prescription. Not to be used for wellness applications.